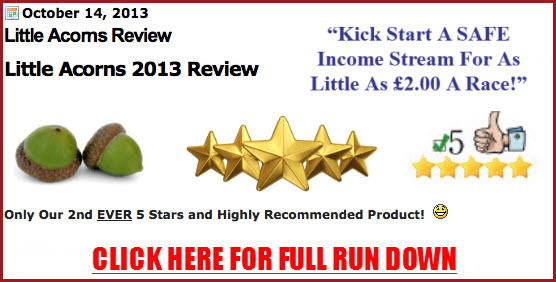 Only Our 2nd EVER 5 Stars and Highly Recommended Product! Little Acorns is a low-liability laying formula that uses low stakes to grow bigger banks and be in the position of being confident to increase your stakes as the bank increases. The system has been developed by Andrew David, who is confident that your betting balance will increase between seven and 35 times each month, without exposing yourself to high liabilities. It was a pretty major decision to do this but over 6 years we decided that Little Acorns was worthy of only our 2nd 5 Star Rating on BST. It is very hard to achieve this ranking and i often wondered over the years whether it would be a backing system or a laying system that achieved 5 star status next to All By The Book. Obviously since Little Acorns was given this accolade Zero Risk Trader has also achieved 5 star status and sits with Little Acorns and All By The Book. The difference however is that All By The Book & Zero Risk Trader are systems that are guaranteed to work all year round as it relies on flaws in the betting world and is not dependant on the user. Where as Little Acorns relies on its method staying profitable and is straight bets. This means that in 6 years Little Acorns is (as of April 2014) the only straight betting product that is highly recommended. I have watched and admired this service since it was released and year on year it makes a profit which is very difficult to do. For an out and out laying service i haven’t seen one better in all my time on line reviewing systems and services. If you did not know, Little Acorns is a low-liability laying formula that uses low stakes to grow bigger banks and be in the position of being confident to increase your stakes as the bank increases. Andrew has said that anyone who purchases through the link below will get access to his Bonus Place Lay system (which is a fantastic bonus) if you ask him for it after purchase. Alex who left a testimonial below the results describes it as phenomenal! Wherever possible we try to monitor our 5* products indefinitely. These products will be updated as often as we can manage. We have had a custom built bot made which we take the figures from and verify them with the product vendor. This is so that we can be sure Little Acorns deserves to remain a 5 Star product for our readers. We have also been following the system using an alternative staking plan called Two Steps Back that is now included with the system. We’ve been following it since February and it has been outperforming the original staking plan. We are no longer using Two Steps Back although it continues to perform well. Some buyers were also able to claim a bonus system which is a Place Lay System. So here are the last results. Just a quick update. Don’t get me wrong, the original little acorns strategy is fine and proving a nice slow burner to date. But the place laying strategy currently seems to be absolutely phenomenal. Really looking forward to seeing how this pans out in the longer run because January 2014 and December 2013 have both been very profitable. PS Still going strong on Football Bankbuilder. With discipline I don’t see how these systems can fail in the long run (but I suppose you already know that). Really suits my preferred approach as well. I have been very fortunate to join Little Acorns at a highly profitable time. Since starting on September 9th I’ve had 19 winning bets and 9 losing bets. I understand that you are willing to supply a few additional “tweaks” and pieces of advice about optimum use of the system and would be grateful to receive them. Also, I would welcome any advice about using a bot for Little Acorns. Little acorns is an absolutely marvellous system, It works because it has the percentages on its side. Many people find little acorns a refreshing change as it makes money for longer than a year, where as most fall off the radar quite quickly once purchased. 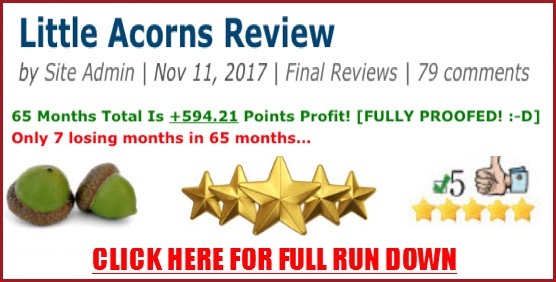 Little acorns has proven to be a long term winner as it takes advantage of the unreliability of horse racing which as we all know is one thing that is certain. Little Acorns has been upgraded to 5 Stars and will remain a champion amongst its competitors. I think this system is an ideal addition to the portfolio of any serious punter and comes with our highest recommendation here at BST. When using this system. Do you need 2 banks if you are using 2 staking levels? £352 for the level staking and more when using the Fibonacci or other staking plans? How much work does it take per day? Do these types of bets in these specific conditions happen often? Or just once a day? Can you use different staking plans the same method and make different streams of income? Sorry Karl the author doesn’t recommend using level stakes so we don’t have level stakes results. Please can you share further information about the bonus place Lay system. Are the results to level stakes? 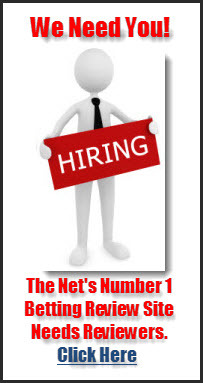 No the bonus place lay system uses Fibonacci staking plan rather than level stakes. 1. Is possible to get similar results with other exchanges? With no worry of acceptation. 2. How big bank is needed to cover all loses? 3. Is this worth to invest huge capital instead of small one to takie advantage and get 1000 points per month? 4. I am little worried about potential loses and huge stakes to get suitable results. The problem with this system for those of us who work during the day – which I’d imagine is most people – is that it’s not feasible to check prices just before the off, at least not if there are numerous races to check. And I presume only using the system in the evenings and at weekends will reduce the number of bets (and hence potential profit) considerably. I use bet engine bot to run this system. Cost 12.50 a month I think. They have a file for little acorns that has all the parameters for it. Just means that I have to leave on my pc for most of the day but still does the job. Does it return a good income using the bot? Is it really as simple as setting and leaving? Hey Paul, What sort of returns are you seeing? I have similar setup running now for 6mths approx. Seeing 7% ROI so far ( Which in my eyes is substantial profit from BF ) but early days. Just over 200 bets so far but eager to up the ante. Not sure about my roi return. I really should be more precise with my bank but I’m seeing around 10 pts profit a month give or take a point over the last year. Had a family illness from February til April so wasn’t running betengine at all thru that period. Have you used the bonus system. I did use it for a while but it bust my bank. I’m seeing the profits that this site says it has made from the bonus system and I am kinda surprised. Maybe I entered the wrong filters into betengine but I don’t think so. I might try it again on virtual mode. Actually looking at the filters I used on betengine for the bonus system think I included some race types that I shouldn’t have. Might explain the difference in my results to bettingsystemtruth. Is this a no risk systems. How do you calculate with points how much you win. Say you have a 100 pound bank with the safest betting plan how much do you make in a month. No it isn’t a no risk system. You couldn’t use this system with a £100 bank. It uses the Fibonacci staking plan. The suggested start bank is 176 points and as the minimum lay bet on Betfair is £2 you would need a minimum start bank of £352. We show how many points profit the system has made each month since 2012.